RTD and Thermocouple input sensors with an electrical contact output at a specific temperature. Dwyer's mechanical switches are lightweight, durable, and small. Applications include mechanical process temperature monitoring, coal mines, HVAC controls, petrochemical plants, and oil rigs or refineries. Temperature Switches has application in mechanical process temperature monitoring. Has a fully adjustable deadband. Has visible, calibrated dial and external adjustments make changing set points simple and fast. 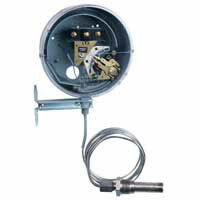 Explosion-Proof, Heavy-Duty Thermostat is designed for hazardous-location temperature control. 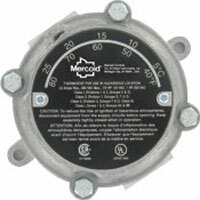 Smallest, lightest and most durable thermostat available. A few applications include coal mines, HVAC control, and petrochemical plants.